CRS Rice Bowl gives a glimpse inside the multifaceted issues surrounding migration. A young South Sudanese refugee raising her siblings in Uganda’s Bidi Bidi refugee settlement. A father returning home after decades of civil war in Sri Lanka to find his farm overgrown. A young woman unable to find work in Gaza—and forbidden from seeking opportunity abroad. These are just some of the stories participants will explore through CRS Rice Bowl, CRS’ Lenten faith-in-action program. Every year, people in more than 14,000 faith communities across the country are using nearly 4 million ‘rice bowls’ for almsgiving, resulting in nearly $12 million annually—$9 million of which supports CRS programs around the world. The remaining $3 million, or 25% of total alms collected, stays in the local diocese, supporting hunger and poverty alleviation efforts. Make it easy for CRS Rice Bowl to accompany you on your Lenten journey by downloading the app and setting a daily reminder to pray with it each day. 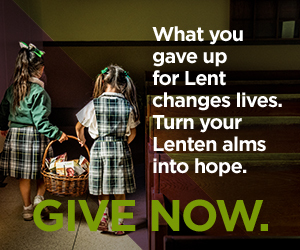 How will you contribute to the culture of encounter this Lent?